Destinypedia has a walkthrough guide to this level, A Guardian Rises. See A Guardian Rises/Walkthrough. 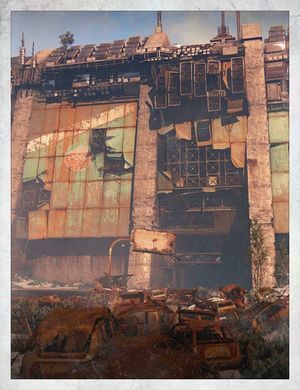 A Guardian Rises is a story mission that takes place in the Cosmodrome in Old Russia, and is the first mission of Destiny. After being dead for an unspecified amount of time, the player's Guardian awakens just outside of the Cosmodrome to the sight of their Ghost, who leads them into The Breach in search of a weapon to defend themselves, and through The Divide to find a ship to take them to the City. The mission acts as a general tutorial, and is the only mission with level 1 enemies and no Darkness Zones. New Guardians will acquire their first primary weapon (a Khvostov 7G-02) and a random special weapon from a loot chest. They will also acquire an Arcadia Class Jumpship in Dock 13. The screen fades from black into a view of space. "Bungie" and "Activision" text appears. A landing pod heads towards Mars's surface and lands. Astronauts leave the pod. The text "THE PLANET MARS" and "PRESENT DAY" appear in various languages. The Astronauts explore the surface of Mars and find an enormous spherical object hovering above the surface. The screen cuts to black and the text "Destiny" with the Destiny logo appears. The screen fades to show a view of the solar system. Narrator: We called it The Traveler, and its arrival changed us forever. Great cities were built on Mars and Venus. Mercury became a garden world. Human lifespan tripled. It was a time of miracles. We stared out at the galaxy and knew that it was our destiny to walk in the light of other stars. But the Traveler had an enemy: a Darkness, which had hunted it for eons across the black gulfs of space. Centuries after our Golden Age began, this Darkness found us, and that was the end of everything. Narrator: But it was also a beginning. The camera pans over the Cosmodrome in Old Russia. There are many old, abandoned, rusted cars. A Ghost flies around, scanning various cars. In the distance a group of Fallen appear. Ghost scans a car. A Fallen Captain views the Ghost through his scope and orders his troops—a Vandal and a Dreg, respectively—to move towards it. Ghost scans another car unaware. The Ghost opens up and continues scanning. The screen fades to black. The screen fades in and then to black again a few times to simulate the effect of eyes opening. Ghost: Guardian. Guardian? Eyes up, Guardian! The Guardian looks at the Ghost. Ghost: It worked. You're alive! You don't know how long I've been looking for you. I'm a Ghost. Actually, now I'm your Ghost. And you... well, you've been dead a long time. So you're going to see a lot of things you won't understand. A Fallen Captain shrieks in the background. The Ghost turns to look and then turns back to the Guardian. Ghost: This is Fallen territory. We aren't safe here. I have to get you to The City. Hold still. The Ghost disappears into the Guardian's inventory. Ghost: Don't worry, I'm still with you. We need to move. Fast. Ghost: We won't survive long out in the open like this. Let's get inside The Wall. Ghost: I didn't bring you back just for you to die again. We have to move. The Guardian heads into the Cosmodrome. Ghost: Okay, I need to find you a weapon before the Fallen find us. The Guardian continues further into the Cosmodrome. Ghost: (Whispering) Quiet. They're right above us. The Guardian continues further into a dark room. Ghost: Hang tight. Fallen thrive in the dark. We won't. We need more light. I'll see what I can do. The Ghost leaves the Guardian and heads into the distance. Ghost: Another one of these hardened military systems and a few centuries of entropy working against me. The Ghost turns the lights. Fallen move on an adjacent bridge. Ghost: They're coming for us! The Ghost returns to the Guardian and opens a door. Ghost: Here! I found a rifle! Grab it! The Guardian picks up a Khvostov 7G-02. Ghost: I hope you know how to use that thing. The Guardian continues and sees a Fallen Dreg disappearing around a corner. The Guardian continues further into The Wall. Ghost: There's more ahead! Keep it up! The Guardian finds a loot chest. Ghost: A loot cache. Let's see what's inside. The Guardian encounters trip mines. Ghost: Trip mines! Don't touch them. The Guardian continues further into The Wall and eliminates a group of Fallen. The Guardian exits The Wall and enters The Divide. Ghost: This was an old Cosmodrome. There's got to be something we can fly out of here. A portal opens in the sky. Fallen ships appear in the sky. Ghost: Fallen ships! This close to the surface?! The Guardian eliminates all of the Fallen from the dropships. Ghost: I'm picking up signs of an old jumpship. Could be our ticket out of here. The Guardian enters Dock 13 and finds an Arcadia Class Jumpship suspended by cables. Ghost: There's a ship! Clear them out! The Guardian eliminates all of the Fallen enemies near the jumpship. Ghost: Alright, let me see if I can get us out of here. The Ghost scans the jumpship. Ghost: It's been here awhile. Hasn't made a jump in centuries. We're lucky the Fallen haven't completely picked it clean. Ghost: I can make it work. The jumpship's engines power on and the jumpship breaks free from the cables, hovering in the air. Fallen enemies enter the room. The jumpship flies out of the building. The Fallen enemies shoot at it. Ghost: We can come back for them when you're ready. Let's get you home. The jumpship leaves the Cosmodrome as the Exo Stranger watches. The jumpship flies through a storm and reaches The City. It drops off the Guardian at the Tower. Ghost: Welcome to the last safe City on Earth--the only place The Traveler can still protect. It took centuries to build. Now, we're counting every day it stands. And this Tower is where the Guardians live. A Guardian Rises can be completed without picking up the Khvostov 7G-02 and instead using only melee attacks. However, this has been fixed where the weapon is placed in the Guardian's hands with or without pickup. Keeping the Khvostov 7G-02 acquired from this mission until the very end of Rise of Iron will allow a few steps in the Khvostov 7G-0X Exotic quest to be skipped. Guardian within the Cosmodrome Wall.